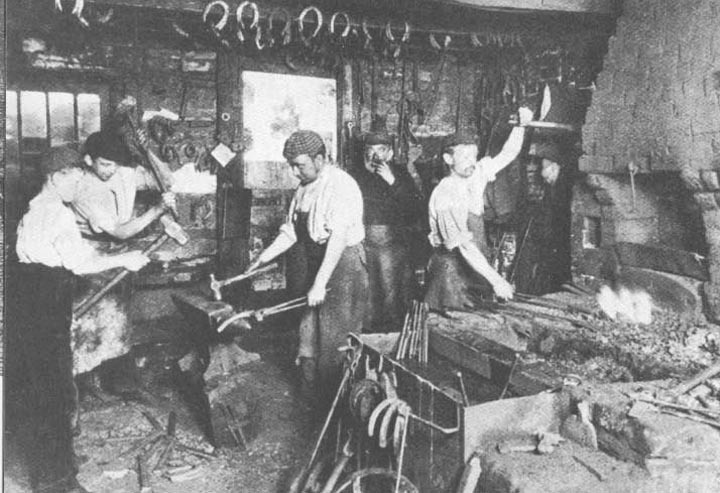 A Victorian Blacksmith's Shop. As this photograph makes clear, blacksmiths had a place among the working classes, and these men worked with their hands and arms in a hot, grimy smithy. Blacksmiths, who have a history that goes back thousands of years, however, had a far higher economic and social position than farm or factory workers. As highly skilled artisans, they also managed to remain independent and in demand until well into the twentieth century when the automobile destroyed many of their opportunities for work. Even then, these skilled iron workers often morphed into auto mechanics just as a century earlier some had become pioneeering engineers. If Pip in Charles Dickens's Great Expectations wants to become a gentleman, a desire for social prestige drives him far more than any need for economic security since smiths were among the most prosperous members of a small town or village, and Joe ends up wealthier than Pip by the end of the novel. Bentley, Nicolas. The Victorian Scene: 1837-1901. London: Spring Books, 1971, p. 100.